fmriprep adapts its pipeline depending on what data and metadata are available and are used as the input. For example, slice timing correction will be performed only if the SliceTiming metadata field is found for the input dataset. The anatomical sub-workflow begins by constructing an average image by conforming all found T1w images to RAS orientation and a common voxel size, and, in the case of multiple images, averages them into a single reference template (see Longitudinal processing). Once the brain mask is computed, FSL fast is utilized for brain tissue segmentation. Finally, spatial normalization to MNI-space is performed using ANTs’ antsRegistration in a multiscale, mutual-information based, nonlinear registration scheme. In particular, spatial normalization is done using the ICBM 2009c Nonlinear Asymmetric template (1×1×1mm) [Fonov2011]. When processing images from patients with focal brain lesions (e.g. stroke, tumor resection), it is possible to provide a lesion mask to be used during spatial normalization to MNI-space [Brett2001]. ANTs will use this mask to minimize warping of healthy tissue into damaged areas (or vice-versa). Lesion masks should be binary NIfTI images (damaged areas = 1, everywhere else = 0) in the same space and resolution as the T1 image, and follow the naming convention specified in BIDS Extension Proposal 3: Common Derivatives (e.g. sub-001_T1w_label-lesion_roi.nii.gz). This file should be placed in the sub-*/anat directory of the BIDS dataset to be run through fmriprep. In the case of multiple T1w images (across sessions and/or runs), T1w images are merged into a single template image using FreeSurfer’s mri_robust_template. This template may be unbiased, or equidistant from all source images, or aligned to the first image (determined lexicographically by session label). For two images, the additional cost of estimating an unbiased template is trivial and is the default behavior, but, for greater than two images, the cost can be a slowdown of an order of magnitude. Therefore, in the case of three or more images, fmriprep constructs templates aligned to the first image, unless passed the --longitudinal flag, which forces the estimation of an unbiased template. The preprocessed T1w image defines the T1w space. In the case of multiple T1w images, this space may not be precisely aligned with any of the original images. Reconstructed surfaces and functional datasets will be registered to the T1w space, and not to the input images. fmriprep uses FreeSurfer to reconstruct surfaces from T1w/T2w structural images. If enabled, several steps in the fmriprep pipeline are added or replaced. All surface preprocessing may be disabled with the --fs-no-reconall flag. Surface processing will be skipped if the outputs already exist. In order to bypass reconstruction in fmriprep, place existing reconstructed subjects in <output dir>/freesurfer prior to the run. fmriprep will perform any missing recon-all steps, but will not perform any steps whose outputs already exist. 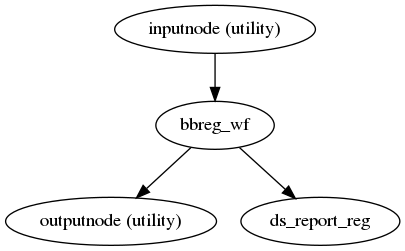 If FreeSurfer reconstruction is performed, the reconstructed subject is placed in <output dir>/freesurfer/sub-<subject_label>/ (see FreeSurfer Derivatives). The second phase imports the brainmask calculated in the T1w/T2w preprocessing sub-workflow. The final phase resumes reconstruction, using the T2w image to assist in finding the pial surface, if available. See init_autorecon_resume_wf() for details. Reconstructed white and pial surfaces are included in the report. If T1w voxel sizes are less than 1mm in all dimensions (rounding to nearest .1mm), submillimeter reconstruction is used, unless disabled with --no-submm-recon. lh.midthickness and rh.midthickness surfaces are created in the subject surf/ directory, corresponding to the surface half-way between the gray/white boundary and the pial surface. The smoothwm, midthickness, pial and inflated surfaces are also converted to GIFTI format and adjusted to be compatible with multiple software packages, including FreeSurfer and the Connectome Workbench. GIFTI surface outputs are aligned to the FreeSurfer T1.mgz image, which may differ from the T1w space in some cases, to maintain compatibility with the FreeSurfer directory. Any measures sampled to the surface take into account any difference in these images. Typically, the original brain mask calculated with antsBrainExtraction.sh will contain some innaccuracies including small amounts of MR signal from outside the brain. Based on the tissue segmentation of FreeSurfer (located in mri/aseg.mgz) and only when the Surface Processing step has been executed, FMRIPREP replaces the brain mask with a refined one that derives from the aseg.mgz file as described in fmriprep.interfaces.freesurfer.grow_mask. 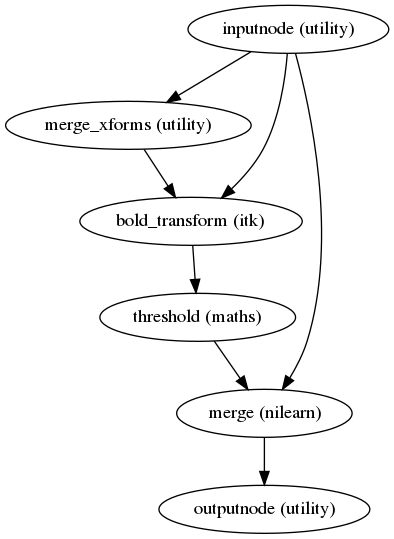 Preprocessing of BOLD files is split into multiple sub-workflows described below. This workflow estimates a reference image for a BOLD series. If a single-band reference (“sbref”) image associated with the BOLD series is available, then it is used directly. If not, a reference image is estimated from the BOLD series as follows: When T1-saturation effects (“dummy scans” or non-steady state volumes) are detected, they are averaged and used as reference due to their superior tissue contrast. Otherwise, a median of motion corrected subset of volumes is used. 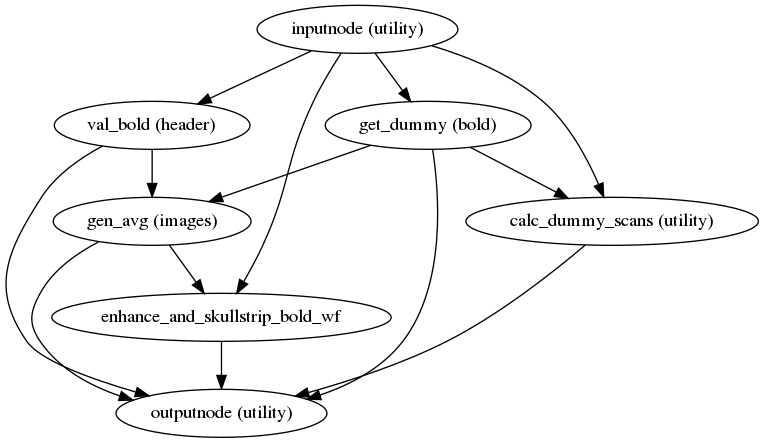 The reference image is then used to calculate a brain mask for the BOLD signal using the fmriprep.workflows.bold.util.init_enhance_and_skullstrip_bold_wf. Further, the reference is fed to the head-motion estimation workflow and the registration workflow to map BOLD series into the T1w image of the same subject. Calculation of a brain mask from the BOLD series. Using the previously estimated reference scan, FSL mcflirt is used to estimate head-motion. As a result, one rigid-body transform with respect to the reference image is written for each BOLD time-step. Additionally, a list of 6-parameters (three rotations, three translations) per time-step is written and fed to the confounds workflow. For a more accurate estimation of head-motion, we calculate its parameters before any time-domain filtering (i.e. slice-timing correction), as recommended in [Power2017]. 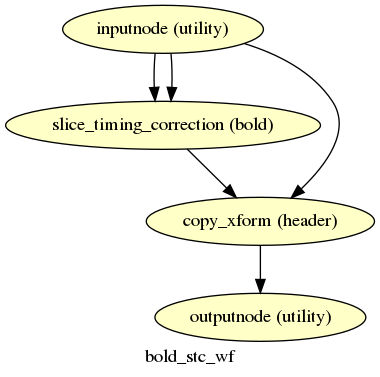 If the SliceTiming field is available within the input dataset metadata, this workflow performs slice time correction prior to other signal resampling processes. Slice time correction is performed using AFNI 3dTShift. All slices are realigned in time to the middle of each TR. Slice time correction can be disabled with the --ignore slicetiming command line argument. If a BOLD series has fewer than 5 usable (steady-state) volumes, slice time correction will be disabled for that run. Applying susceptibility-derived distortion correction, based on fieldmap estimation. One of the major problems that affects EPI data is the spatial distortion caused by the inhomogeneity of the field inside the scanner. Please refer to Susceptibility Distortion Correction (SDC) for details on the available workflows. A new preproc BOLD series is generated from the slice-timing corrected or the original data (if STC was not applied) in the original space. All volumes in the BOLD series are resampled in their native space by concatenating the mappings found in previous correction workflows (HMC and SDC if excecuted) for a one-shot interpolation process. Interpolation uses a Lanczos kernel. The alignment between the reference EPI image of each run and the reconstructed subject using the gray/white matter boundary (FreeSurfer’s ?h.white surfaces) is calculated by the bbregister routine. 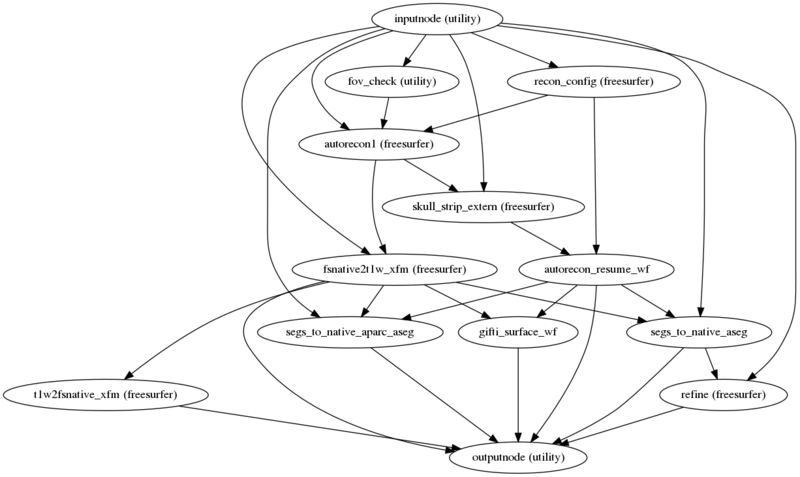 If FreeSurfer processing is disabled, FSL flirt is run with the BBR cost function, using the fast segmentation to establish the gray/white matter boundary. After BBR is run, the resulting affine transform will be compared to the initial transform found by FLIRT. Excessive deviation will result in rejecting the BBR refinement and accepting the original, affine registration. This sub-workflow concatenates the transforms calculated upstream (see Head-motion estimation, Susceptibility Distortion Correction (SDC) –if fieldmaps are available–, EPI to T1w registration, and a T1w-to-MNI transform from T1w/T2w preprocessing) to map the EPI image to standard MNI space. It also maps the T1w-based mask to MNI space. Transforms are concatenated and applied all at once, with one interpolation (Lanczos) step, so as little information is lost as possible. 'native': the original resolution of the BOLD image will be used. '1mm': uses the 1:math: times`1:math: times`1 [mm] version of the template. '2mm': uses the 2:math: times`2:math: times`2 [mm] version of the template. Path to arbitrary reference file: the output will be resampled on a grid with same resolution as this reference. If FreeSurfer processing is enabled, the motion-corrected functional series (after single shot resampling to T1w space) is sampled to the surface by averaging across the cortical ribbon. Specifically, at each vertex, the segment normal to the white-matter surface, extending to the pial surface, is sampled at 6 intervals and averaged. Surfaces are generated for the “subject native” surface, as well as transformed to the fsaverage template space. All surface outputs are in GIFTI format. 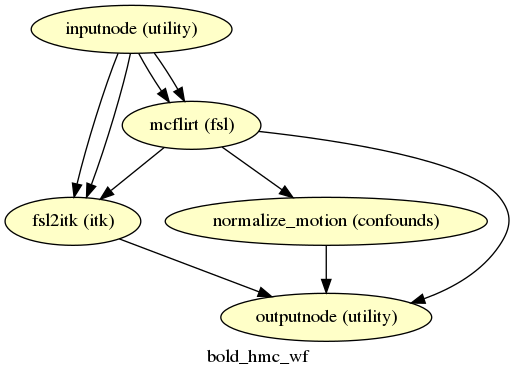 Given a motion-corrected fMRI, a brain mask, mcflirt movement parameters and a segmentation, the discover_wf sub-workflow calculates potential confounds per volume. Calculated confounds include the mean global signal, mean tissue class signal, tCompCor, aCompCor, Frame-wise Displacement, 6 motion parameters, DVARS, and, if the --use-aroma flag is enabled, the noise components identified by ICA-AROMA (those to be removed by the “aggressive” denoising strategy). Particular details about ICA-AROMA are given below. When one of the –output-spaces selected is in MNI space, ICA-AROMA denoising can be automatically appended to the workflow. The number of ICA-AROMA components depends on a dimensionality estimate made by MELODIC. For datasets with a very short TR and a large number of timepoints, this may result in an unusually high number of components. By default, dimensionality is limited to a maximum of 200 components. To override this upper limit one may specify the number of components to be extracted with --aroma-melodic-dimensionality. 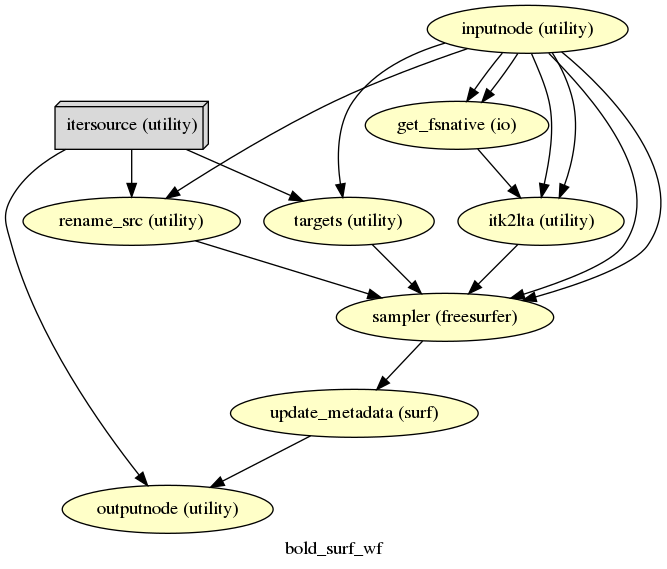 Further details on the implementation are given within the workflow generation function (fmriprep.workflows.bold.confounds.init_ica_aroma_wf). Note: The non-steady state volumes are removed for the determination of components in melodic. Therefore *MELODICmix.tsv may have zero padded rows to account for the volumes not used in melodic’s estimation of components. A visualization of the AROMA component classification is also included in the HTML reports. Maps created with maximum intensity projection (glass brain) with a black brain outline. Right hand side of each map: time series (top in seconds), frequency spectrum (bottom in Hertz). Components classified as signal in green; noise in red. If multi-echo BOLD data is supplied, this workflow uses the tedana T2* workflow to generate an adaptive T2* map and optimally weighted combination of all supplied single echo time series. This optimaly combined time series is then carried forward for all subsequent preprocessing steps. Optionally, if the --t2s-coreg flag is supplied, the T2* map is then used in place of the BOLD reference image to register the BOLD series to the T1w image of the same subject. © Copyright 2016-2019, The FMRIPREP developers Revision a8ef9a3b.